I was pleasantly surprised with my stay here. Everything went great. The room was very clean, as was the bathroom. The staff were all very friendly and pleasant to deal with. And, there's a great breakfast too. 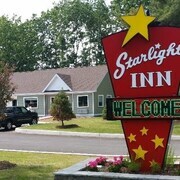 This hotel is situated at an intersection of an I-87 off-ramp and Route-3, but the motel rooms are very quiet inside. I was a great stay, I will return in the future, and I do recommend this hotel to others. Where to find Colchester hotels near an airport? Where can I find hotels in Colchester that are near tourist attractions? If you are seeking comfortable hotels and apartments in Colchester, you're simply spoiled for choice. About 22 places to stay are within a 0.1-kilometre (0.06-mile) radius from Colchester's center. There are a range of accommodation options within a short stroll from Colchester's heart, including the Residence Inn by Marriott Colchester and Hampton Inn Burlington. The Days Inn Burlington Colchester is situated 6 kilometres (4 miles) away from the heart of Colchester and is the perfect choice for travelers on a budget. You could also check out the rates at the Handys Extended Stay Suites Colchester. 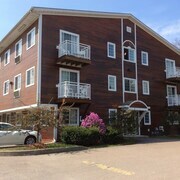 9 kilometres (6 miles) from downtown Colchester, is the Hotel Vermont. 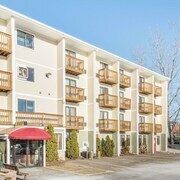 The Courtyard Marriott Burlington Harbor is situated 9 kilometres (6 miles) away. You could also book a room at the The Inn at Grace Farm or the Hilton Burlington. After you have really explored Colchester, why don't you tour a bit further afield? 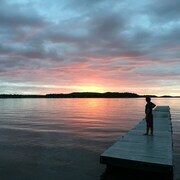 The Northern Vermont region has plenty of things to offer visitors. View Northern Vermont's forests and mountains. You could also spend time at a few of its open-air markets. Fun-loving travelers can try snowboarding and skiing in this part of United States of America. Looking for more to do? Spend some time exploring Charlotte Village Winery and Mt. Philo State Park, in Charlotte, 25 kilometres (17 miles) to the south of Colchester. 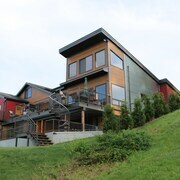 The The Inn at Charlotte Bed and Breakfast and Bryn Meadow Farm and B&B are some of the Expedia-listed apartment and hotel alternatives in Charlotte. 19 kilometres (12 miles) to the south of Colchester, is Shelburne, home to the Holiday Inn Express South Burlington and Comfort Suites. The Shelburne Museum and Vermont Teddy Bears are a couple of the more popular places to see while in Shelburne. Before you say goodbye to Burlington, ensure you experience some local sport. Visit Olympic Center to the southwest of Colchester. Stay close to the action at the The Whiteface Lodge or the High Peaks Resort. Burlington International Airport is a logical airport for flying into Colchester. It is 8 kilometres (5 miles) drive away. 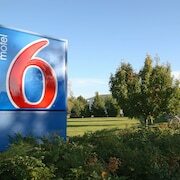 If you plan to stay nearby, try the Sonesta ES Suites Burlington VT or Courtyard by Marriott Burlington Williston. What are the most popular Colchester hotels? 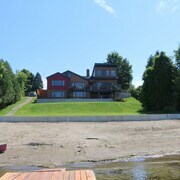 Cottage on Malletts Bay - Dogs Welcome! Are there hotels in other cities near Colchester? What other types of accommodations are available in Colchester? Explore Colchester with Expedia.ca’s Travel Guides to find the best flights, cars, holiday packages and more!